From 1984 to 1987, Iraq used sulfur mustard (SM) and other chemical warfare agents (CWA) against Iranian veterans and civilians. It is estimated that between 45,000 and 100,000 Iranians chemically injuring in this conflict. ,, SM is one of the most important and mortal CWA which could cause various acute or long-term physical complications including the eyes, lungs, and skin disorders. These complications and other disabilities affect individual physical function. Therefore, these physical disabilities and maintained distress can induce psychological and mental health disorders. The psychological morbidity of war on veterans has been explained since many years ago, but the term of posttraumatic stress disorder (PTSD) was used after the Vietnam War. It is confirmed that PTSD symptoms have a strong relationship with toxin exposure and physical diseases and disabilities. Schnurr et al., assessed PTSD associated with participation in secret military tests of SM during World War II in military veterans and came up with a current prevalence of 32% for full PTSD and 10% for partial PTSD. There are so many studies about mental health disorders and PTSD among veterans,  but there are few reports about psychological consequences of CWAs although psychological disorders secondary to the nonchemical war was clearly characterized. We aimed to assess the psychological state and the current incidence of PTSD in Iranian veterans who exposed to SM long time after the war ended. In order to confirm diagnosis of PTSD, a psychiatrist (Gholam-Reza Karami) carried out all interviews in a private setting using the diagnostic criteria set forth in the Diagnostics and Statistical Manual of Mental Disorders (DSM-IV). Participants were diagnosed with PTSD based on their IES-R questionnaire and interview. Mental health was examined using validated Persian version of self-reporting GHQ-28. Likert scoring styles (0-1-2-3) was used for the 28 questions. Each item is rated on a four possible responses including not at all, no more than usual, rather more than usual, and much more than usual. Its total score range was from 0 to 84 and the higher the score indicated, the worse the mental health. The cutoff value was considered 23 and any score above 23 indicates the presence of distress or caseness (sensitivity 84.7%, specificity 93.8%). , The GHQ contains four subscales including depression, psychosocial activity, anxiety, and somatic symptoms. T-test, analysis of variance, and Chi-square and Kruskal-Wallis test were used for analysis. All analyses were done using Statistical Package for Social Sciences (SPSS) software 16 th edition (Chicago, Illinois, USA) and P<0.05 were statistically considered significant. In all 100 SM injured male veterans were studied. The mean (±SD) age of the participants was 40.63 years (±5.86). The mean period of active combat in PTSD patients and non-PTSD individuals was 41.63±22.81 and 36.15±22.94 months, respectively (P>0.05) and the mean of somatic disability was 35±11. The mean GHQ-28 (47.34) of the study group was higher compared to standardized cutoff point (23) of the Iranian community. The mean score of four subscale containing depression, psychosocial activity, and anxiety and somatic symptoms were 10.16, 10.73, 13.63, and 12.82, respectively. [Table 1] demonstrates the participants' scores in the GHQ-28 and its subscale. Also, based on results of total score for subjective distress (PTSD score) as measured by the IES-R yield and interview it was found that 38 participants (38%) suffer from PTSD. 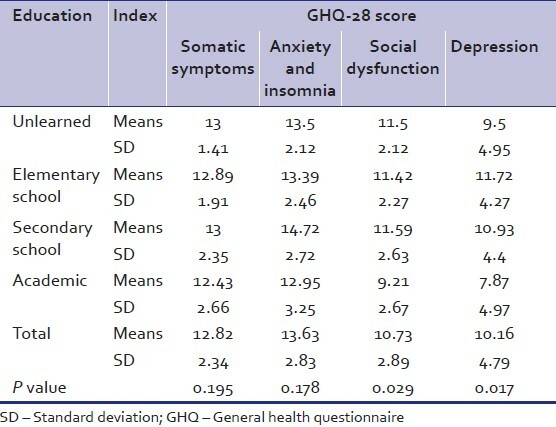 As is shown in [Table 2], the mean score of GHQ in the PTSD and non-PTSD groups was 16.65±2.43 and 15.95±1.88, respectively (P>0.05). It is noteworthy that academic education in the PTSD group was less than that in the non-PTSD group (P = 0.03). The mean score of depression and psychosocial activity subscale in patients at higher education level (7.67±5.14 and 9.1±3.19) was lower than patients at lower education level (9.5±4.95 and 11.5±2.12) and this difference was statistically significant (P<0.05). The mean score of GHQ in personnel of medical care unit was significantly lower than other occupational group (29.67) and the mean score of GHQ in retired individuals was significantly lower than other one (49.7) (P<0.05). The patients who had positive history of hospitalization had higher GHQ score rather than who did not (51.36 vs 44.67, P<0.05). Also, the veterans whose wife's education levels was high had lower score in depression and psychosocial activity subscale and total GHQ score (6.67±5.99, 9.17±3.76, and 40.33±13.87) rather than whose wives' education levels was low (13±1.87, 12.2±1.30, and 50.6±4.56), significantly (P<0.05). In multivariate analysis we found that only education level of the veterans and their wives were effective on the mental health score (adjusted P=0.036 and 0.041, respectively). There were no significant association between the mean period of active combat, age, number of children, percent of disability, and GHQ score (P>0.05). The mean GHQ-28 (47.34) of the study group was higher compared to standardized cutoff point (23) of the Iranian community. Regarding to the findings, the veterans who exposed with SM had low level of mental health as compared to the reference cutoff point. , We found that the most affected subscale in these patients was anxiety and insomnia and the lowest one was depression subscale. Also, the previous study emphasized on the role of physical symptoms and disability on the PTSD presentation which is different from our findings. Another finding of note was that the subjects in the non-PTSD group enjoyed a higher level of education than those comprising the PTSD group. It merits emphasis that while a lower level of education is a risk factor for the development of PTSD, PTSD itself can affect education attainment. Moreover, one of important factors that make a significant contribution to the overall risk for mental disorder secondary to the major physical trauma is gender and this was limitation of the present study. Finally, we recommend that veterans with chronic physical disability must be conserved more attentively especially who stand in lower education level; although further study with greater sample size and excluding confounders such as age at injury and education level at injury time seems to be necessary. It is better to design further studies for evaluating PTSD and predisposing and related factors between chemical warfare injured veterans and nonchemical injured veterans to make a definite conclusion. 1. Ghazanfari T, Faghihzadeh S, Aragizadeh H, Soroush MR, Yaraee R, Mohammad Hassan Z, et al. Sardasht-Iran Cohort Study Research Group. Sardasht-Iran cohort study of chemical warfare victims: Design and methods. Arch Iran Med 2009;12:5-14. 2. Mousavi B, Soroush MR, Montazeri A. Quality of life in chemical warfare survivors with ophthalmologic injuries: The first results form Iran chemical Warfare Victims Health Assessment Study. Health Qual Life Outcomes 2009;7:2. 3. Hashemian F, Khoshnood K, Desai MM, Falahati F, Kasl S, Southwick S. Anxiety, depression, and posttraumatic stress in iranian survivors of chemical warfare. JAMA 2006;296:560-6. 4. Chauhan S, Chauhan S, D'cruz R, Faruqi S, Singh KK, Varma S, et al. Chemical warfare agents. Environ Toxicol Pharmacol 2008;26:113-22. 5. Ford JD, Schnurr PP, Friedman MJ, Green BL, Adams G, Jex S. Posttraumatic stress disorder symptoms, physical health, and health care utilization 50 years after repeated exposure to a toxic gas. J Trauma Stress 2004;17:185-94. 6. Schnurr PP, Ford JD, Friedman MJ, Green BL, Dain BJ, Sengupta A. Predictors and outcomes of posttraumatic stress disorder in World War II veterans exposed to mustard gas. J Consult Clin Psychol 2000;68:258-68. 7. Ben-Zeev D, Corrigan PW, Britt TW, Langford L. Stigma of mental illness and service use in the military. J Ment Health 2012;21:264-73. 8. Creamer M, Bell R, Failla S. Psychometric properties of the impact of event scale-revised. Behav Res Ther 2003;41:1489-96. 9. American Psychiatric Association. Diagnostic and Statistical Manual of Mental Disorders, 4 th ed. DSM-IV-TR code 309.81. 10. Malakouti SK, Fatollahi P, Mirabzadeh A, Zandi T. Reliability, validity and factor structure of the GHQ-28 used among elderly Iranians. Int Psychogeriatr 2007;19:623-34. 11. Noorbala AA, Bagheri Yazdi SA, Mohammad K. Validation of GHQ-28 in Iran. Hakim J 1999;5:101-10. 12. Campos Barreiro A, Alonso Safont T, Sanchez Calso A, Durban Peralias FJ, Manget Velasco S. Psychologic morbidity in perimenopause. Concordance of its diagnosis between a primary care team and its referral mental health center. Aten Primaria 1998;21:613-6. 13. Tannenbaum C. Effect of age, education and health status on community dwelling older men's health concerns. Aging Male 2012;15:103-8. 14. Luo X, Edwards CL, Richardson W, Hey L. Relationships of clinical, psychologic, and individual factors with the functional status of neck pain patients. Value Health 2004;7:61-9. 15. Jankowski MK, Schnurr PP, Adams GA, Green BL, Ford JD, Friedman MJ. A mediational model of PTSD in World War II veterans exposed to mustard gas. J Trauma Stress 2004;17:303-10. 16. Engdahl B, Dikel TN, Eberly R, Blank A Jr. Comorbidity and course of psychiatric disorders in a community sample of former prisoners of war. Am J Psychiatry 1998;155:1740-5. 17. Ginzburg K, Ein-Dor T, Solomon Z. Comorbidity of posttraumatic stress disorder, anxiety and depression: A 20-Year longitudinal study of war veterans. J Affect Disord 2010;123:249-57. 18. Kawana N, Ishimatsu S, Kanda K. Psycho-physiological effects of the terrorist sarin attack on the Tokyo subway system. Mil Med 2001;166:23-6. 19. Romano JA Jr, King JM. Psychological casualties resulting from chemical and biological weapons. Mil Med 2001;166:21-2. 20. Mohaghegh-Motlagh SJ, Arab A, Momtazi S, Musavi-Nasab SN and Saburi A. Psychological assessment of chemical injured war veterans compared to non-chemical injured war veterans. Asia-Pacific Psychiatry 2012;4:189-94. 21. Grills-Taquechel AE, Littleton HL, Axsom D. Social support, world assumptions, and exposure as predictors of anxiety and quality of life following a mass trauma. J Anxiety Disord 2011;25:498-506. 22. Jones N, Wink P, Brown RA, Berrecloth D, Abson E, Doyle J, et al. A clinical follow-up study of reserve forces personnel treated for mental health problems following demobilisation. J Ment Health 2011;20:136-45. 23. Carter-Snell C, Hegadoren K. Stress disorders and gender: Implications for theory and research. Can J Nurs Res 2003;35:34-55.